Here are the Blooming Basket Bundle and the Springtime Foils Specialty Designer Paper. 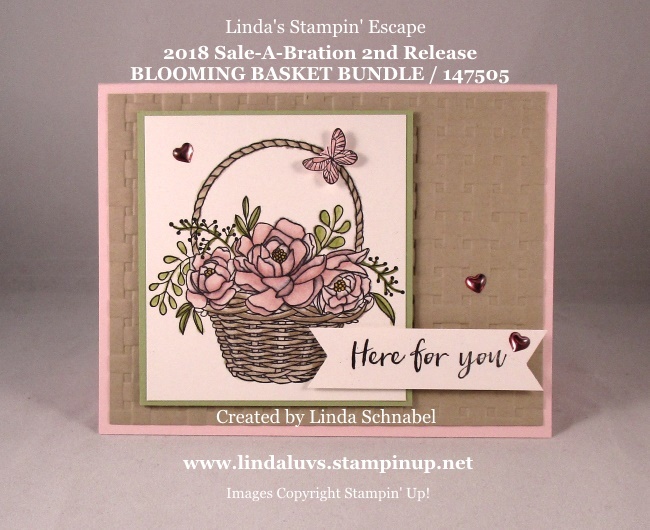 Today I will share a pretty card that I created using the Blooming Basket Bundle. The beautiful stamp set has a coordinating Embossing Folder (which will be available in the upcoming (2018-2019 Annual Catalog). My color pallet began with the Pink Pirouette and Crumb Cake with a touch of Pear Pizzazz Cardstock (Old Olive Stampin’ Blends). The Crumb Cake was embossed with the Basket Weave Dynamic Embossing Folder and a spritz of water … this softens the fibers on the cardstockt and allows it to emboss without putting to much strain (tearing) your cardstock. 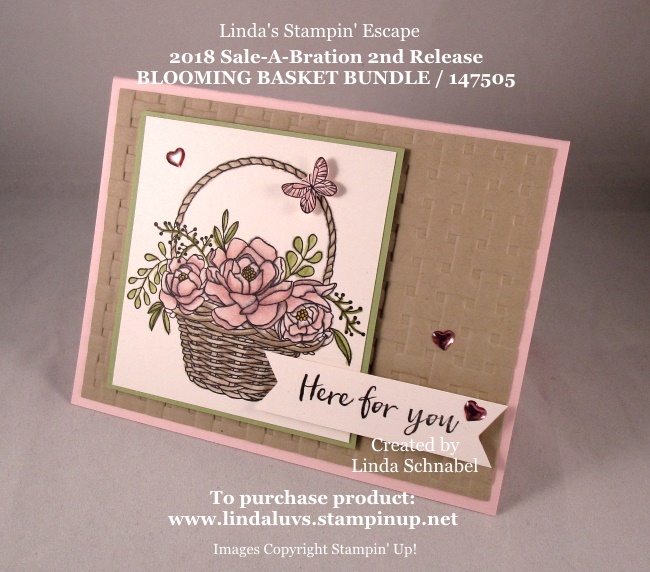 I stamped my basket image with the Archival Black onto the Shimmery White cardstock… Then it’s colored with the Pink Pirouette, Crumb Cake, and Old Olive Stampin’ Blends. I also used the “Color Lifter” to go back over my colored area of the basket and created the highlights! The greeting is included in the stamp set and was punched out with the Triple Banner Punch. I finished off my card with a trio of Hearts from the Metallic Enamel Shapes colored with the Pink Pirouette and Light Rich Razzleberry Stampin’ Blends! I love how the light reflects on these cute little enamel hearts! 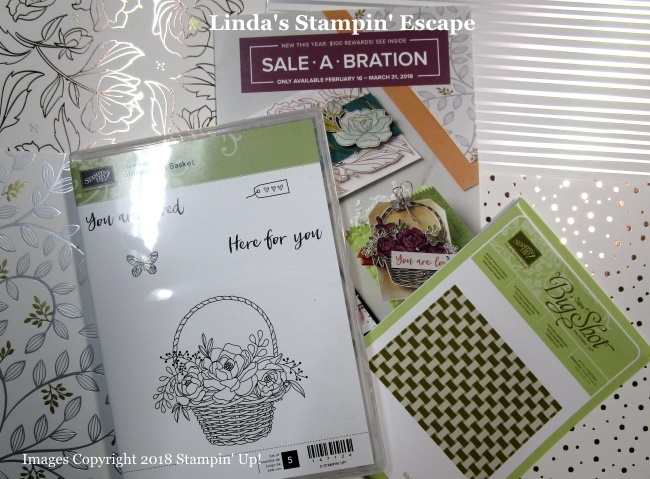 If you’d like to host a Stampin’ Party and really take advantage of all Sale-A-Bration has to offer, and have a great night or afternoon stampin’ with your friends. Thanks for joining me today. Stop back tomorrow as I share my card using the Springtime Foils! « Second Sale-A-Bration catalog release begins today! !